Happy midterm season, Hoyas! While it may be crunch-time in the classroom, you can only run on a double-shot of espresso from Midnight for so long; you should treat yourself! What I’m talking about here is productive procrastination: distractions you can feel good about. The key to productive procrastination is overdoing it and doing it well. 4E is here to show you how. Did someone accidentally jump into your Village B wall the other night and leave a gaping hole? Well, what better time than now to fix it? File that maintenance request, and while you’re at it, why not explore the other failings of your crumbling apartment? Does the right faucet in the bathroom leak? Is the outlet closest to the couch failing to charge your laptop? And what about that mysterious stain on your couch cushion left over from last year’s occupants? File them all away into the interweb for maintenance to deal with while you’re gone. Cleanse your Facebook friends. Let’s face it, you probably don’t need to be friends with the old middle school meathead or that chick from the DC Summer Conference you attended during your sophomore year summer. Here’s a tip from a serial friend-remover: Check out your Facebook birthday list. If it’s their special day and you don’t feel inclined to send them good wishes, delete ’em. But don’t stop at just this month’s birthdays; purge through April’s and May’s while you’re at it. You don’t need all that newsfeed clutter anyway. Speaking of Spring Break, what better way to use your wandering brain waves than trolling around Trip Advisor for “25 Best Things to Do in Cancun” ? There’s nothing worse than arriving at your gorgeous Best Western Motel all-expense paid trip and having no idea what to do next. Is there a local zoo with a rare snake exhibit? What about a modern art showcase on the intricacies of recyclable beauty? Oh, wait, is that a Groupon for bottomless mojitos and tortilla chips after 10 AM at the Crazy Frog? And finally, as I’m sure you haven’t called your mom except in a stressed-out, crying fit all week, give her a ring. If anything, calling now will lessen how angry she’ll feel about the inevitable “I need $100 in my bank account mom, please. This is the last time, I promise” text you send her next week. But while you’re at it, call Grandma, Aunt Sue, your long-distance ex-but-not-really-ex-girlfriend; why not? On second thought, maybe it’s best to just text dad and ask to Facetime with the dog. You do have tests to study for, after all! On the 17th, Kanye tweeted that his newest single would be premiering in a unique fashion – with installation art video performances at scheduled locations across the globe. Kanye has never been one to shy away from controversial statements about race in America or about life in general and this new track is certainly no exception. Juxtaposing the standards of life on the streets and life among the stars, “New Slaves” certainly follows West’s knack for stirring up polemic audience responses. “New Slaves” is less personal than some of his other tracks have been, considering the fact that all of 2010’s My Beautiful Dark Twisted Fantasy (one of my favorite albums ever) is essentially a musical therapy session over the loss of his mother and the fallout over the Taylor Swift incident but Yeezy’s characteristic self-awareness is still evident. He knows that he is firmly entrenched in the upper echelon he raps about, but he still sees the effects of racism even at the top. But it’s Kanye, so it’s bursting with attitude and loud-mouthed swagger. I’m already obsessed with it. Kanye has mastered the art of using overwhelming narcissism and materialism to cope with self-loathing and it shows on this track. He performed the song again this past Saturday as the musical guest on Saturday Night Live along with another new song called “Black Skin Head.” There’s clearly a heavy racial element going on with his new tracks, which may make some fans uncomfortable if the theme continues on the rest of the new album, but I doubt Kanye really cares how you feel. If you’re ever feeling down, y’all should really consider trying Kanye’s coping method. It’s hard to feel bad about yourself when you walk around acting like the sun shines for no one but you. 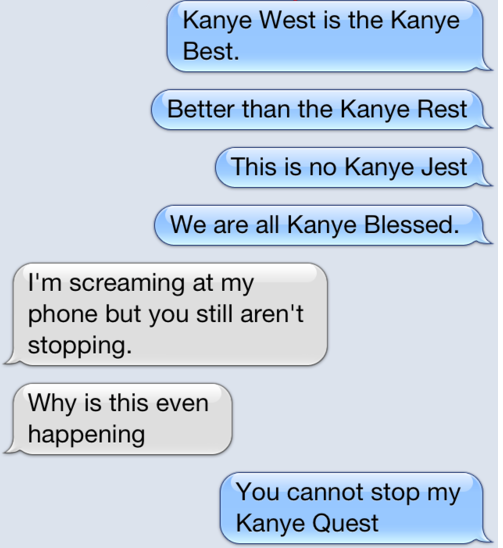 In the meantime though, keep your eyes out for the latest music and antics from the ever-controversial Kanye.